Some challenges when Building on an upslope block. Building on an upslope block you will be faced with a different set of challenges to a down slope block. An upslope block will rise up from the front to the rear of the site. In this scenario you generally will walk up to the front door or drive up to the garage. 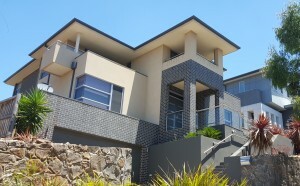 When compared with a down slope block building on an up slope block can be more expensive. Obviously the degree of the slope plays a big part on how expensive and complex the build will be. Depending on the degree of slope the garage on an up slope block is usually cut into the slope to some degree. The steeper the site, the deeper the cut will be. By cutting the garage into the slope you can reduce the steepness of the drive way and maximise the use of your land by building the next floor over the garage. From the front, the home will be quite imposing as it could be as high as three stories. There will usually be steps from the driveway or foot path leading up to the front door. At the rear it will be similar to a home built on a flat block. The design may have a number of split levels incorporated into the floor plan to try and follow the contour of the land as much as possible. The biggest cost difference between building on an up slope block and a down slope block is going to be the earth works. Take a moment to consider the equipment needed to move earth. Backhoes, loaders and rammers are key to excavating, filling and compacting soil. More time and energy is involved in preparing a steep site than a flat one. An additional area near the site may be necessary to store the excavated soil until it is needed for backfilling. You will probably also have to extend the excavation into the rear yard to have a level transition from living to outdoor areas. With excavation the deeper you go the greater the chance of striking rock. Rock is very expensive to remove and dump in land fill. When you excavate 2, 3 or more meters into the ground, the surrounding soil needs to be retained with retaining walls. Non structural retaining walls are usually seen as part of the landscape and can be constructed from timber. Retaining walls which are part of your homes structure need to be engineered. The deeper the excavation the stronger and taller the wall needs to be. A typical retaining wall to a basement garage will consist of a large wide footing (foundation) to support the wall and prevent it from tilting from pressure applied to it from the earth behind it. The wall itself is built from concrete block or double brick which is reinforced with steel bar and filled with concrete. Because the excavation and retaining walls interfere with the natural flow of water down the hill, where the wall is in contact with the earth, it needs to be waterproofed (tanked) and drained (agricultural drains). These serve the purpose of diverting any water build up behind the wall away to the stormwater drains. Once the basement has been constructed there will be substantial structural steel required to support the floors above. It is this basement work (known as site costs) that adds a considerable amount to constructing on this type of block, as opposed to a flat site. There are also additional cost associated with labour, placing of materials and scaffolding due to the additional height of the home. 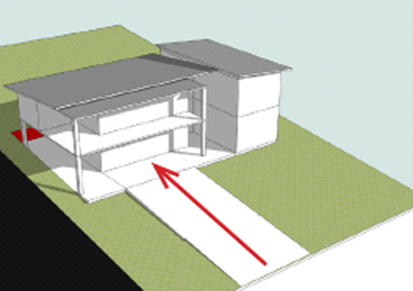 When building on an upslope block considerations should be given to the house design. As excavation and associated engineering costs are expensive, an experienced designer will minimise these by having the plan follow the contours of the land. This can be achieved with split level design, where the floor plan hugs the fall of the land as much as possible. Things to remember when adopting a split level design. With an up slope block you will have higher ceilings to the front before the split and lower ceilings to the rear. You should avoid as much as possible going in excess of 3m high with your ceilings as this takes most building products outside standard sizes and heights and adds extra cost. In addition heating becomes more difficult and even changing light globes can be a challenge. If you wish to maintain the same ceiling height throughout the ground floor, then the split level will also apply to any floors above. There will be some cost considerations with additional external cladding where the home actually splits. Split levels to both floors on double/triple storey homes tend to have more complex engineering and as such, more costs. However sometimes height restrictions in certain developments mean that you will have no choice but to split level both floors. 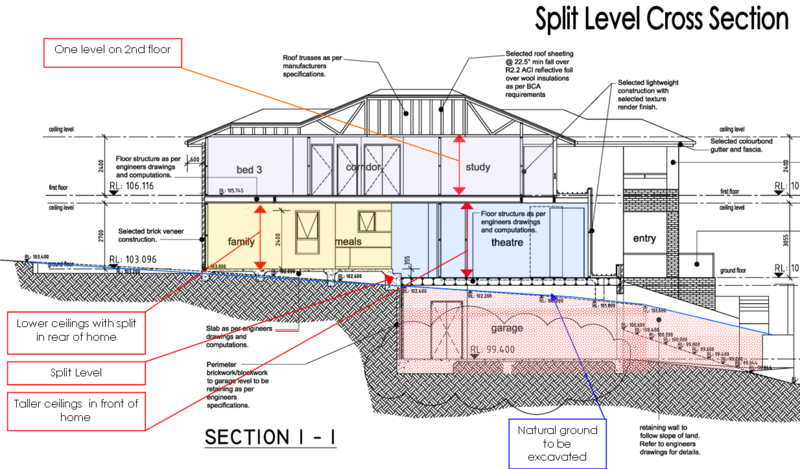 Below is a cross section of a typical up slope build showing the change in ground floor levels to follow the land, the extent of excavation to a basement garage and excavation to the rear yard. When deciding on your block or commencing the design, always consider the grade of the driveway in comparison to the street and the garage. Although there are Australian standards that cover this it is not unusual to see homes that have driveways that are far too steep to be practical due to excessive grade. Your designer needs to take this into consideration early in the design phase. Finally up slope homes tend to have the entry quite high up in comparison to the street. Concrete steps in this situation can be expensive as they are normally built in between brick walls that act as retaining walls to the front yard. Building on an upslope site can be expensive, however with the right design and builder you can minimise costs and build yourself a home that is individual with a unique and functional design.